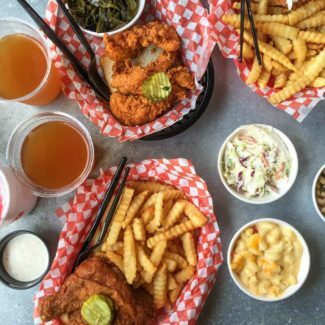 Nashville is known for it’s hot fried chicken, biscuits, and barbecue. 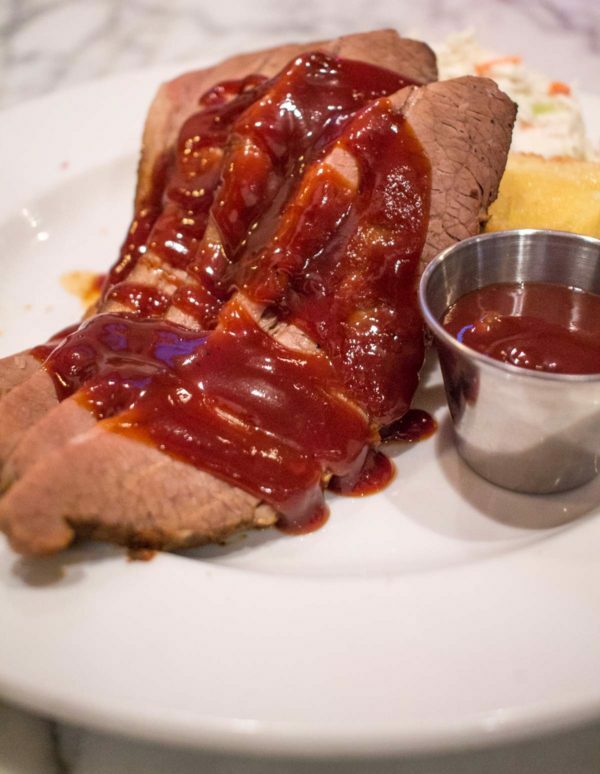 I happily indulged in Nashville’s cuisine, eating all of the city’s staples during my trip. 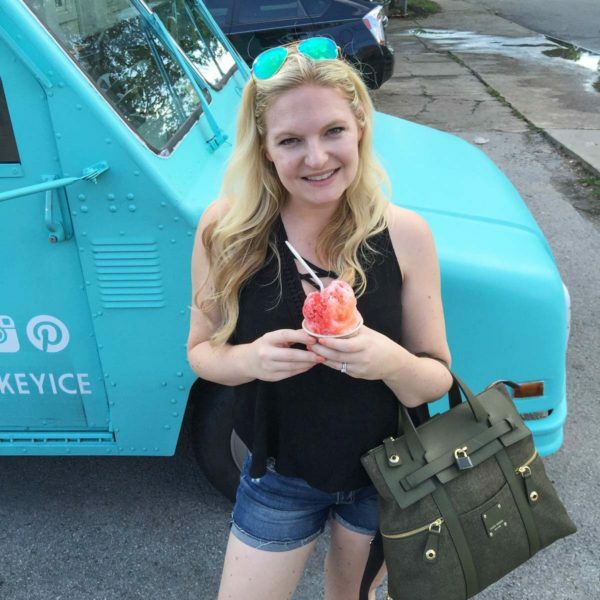 Today I am going to tell you where to eat in Nashville. Let’s go. 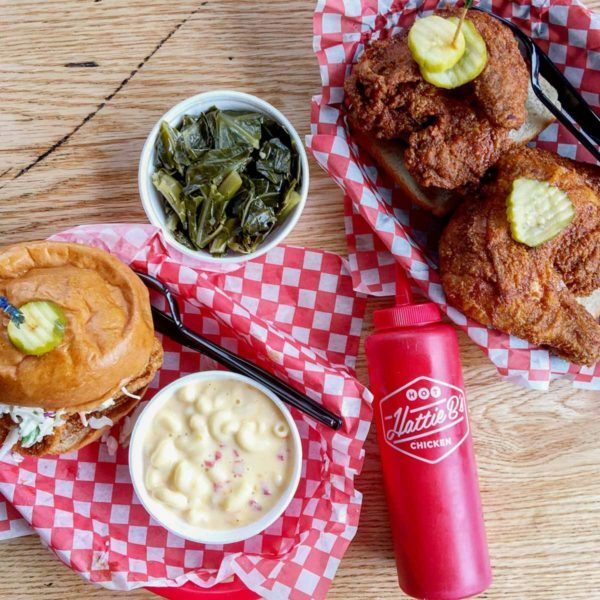 The first place we ate at in Nashville was Hattie B’s for Nashville Hot Fried Chicken. It was so spectacular that I went there twice, and it’s getting its own blog post next week. 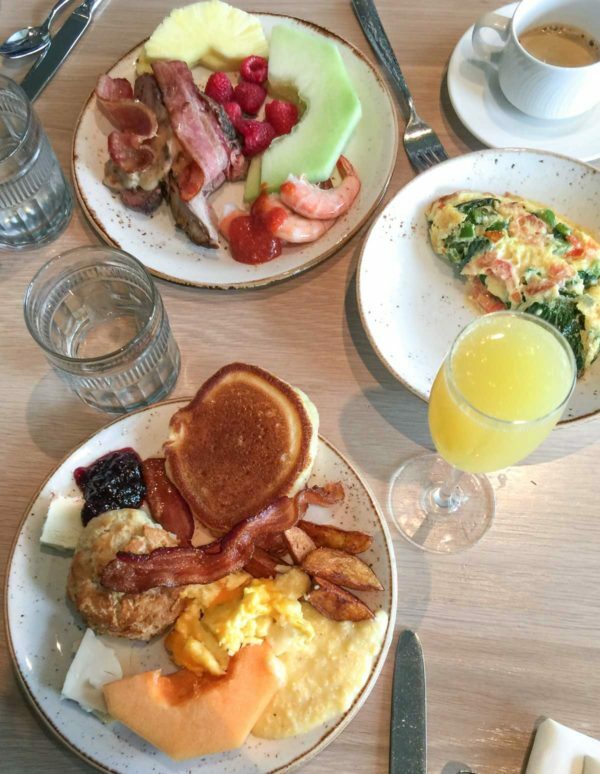 The best brunch we had was at Kitchen Notes. 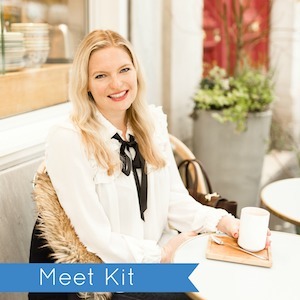 My Windy City Blogger Collective business partner, Erin, had just been to Nashville and she set up brunch for us at Kitchen Notes at the Omni Hotel. 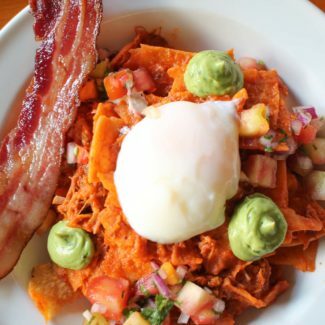 I was a little skeptical about brunch at a hotel restaurant but we were blown away. The restaurant has a bright airy space with high ceilings and floor to ceiling windows. 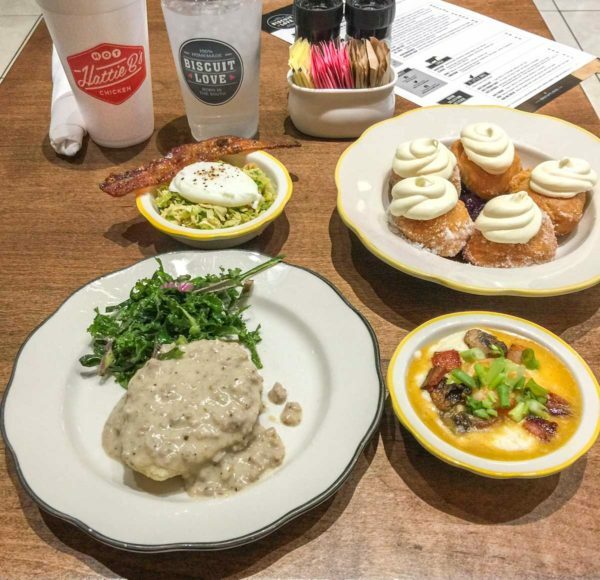 We couldn’t resist ordering the brunch buffet, which consists of classic brunch items and Southern staples. 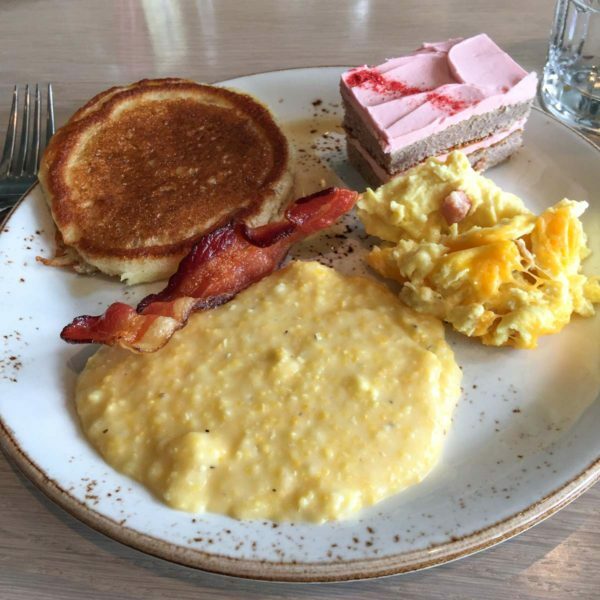 We feasted on scrambled eggs, bacon, the very best pancakes I have ever tasted, cheesy grits, biscuits, sausage, and desserts. 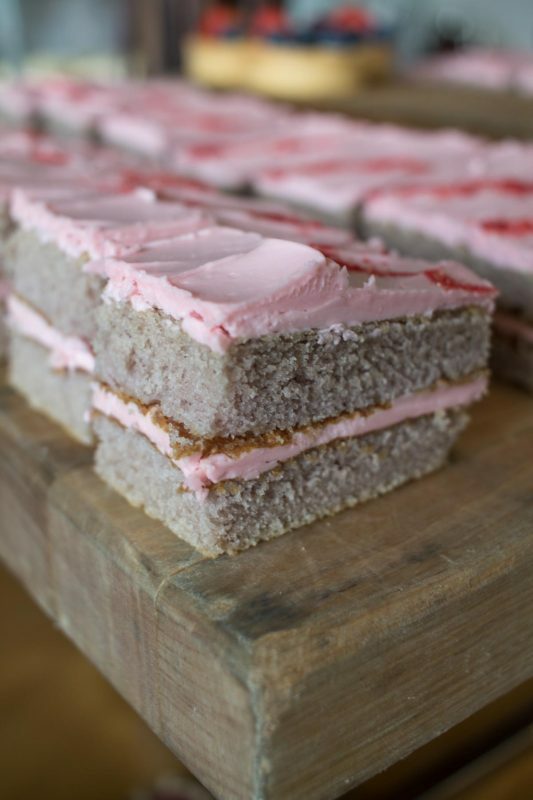 Brunch ended with a visit to the dessert table and this sweet little strawberry cake. I understood why Erin made such a point to send us there. And you should make a point to go too. On a hot afternoon, we spotted a shaved ice truck called Blue Monkey Shaved Ice and figured that it would be the perfect way to cool off. I had Georgia Peach and Strawberry. Charles got Watermelon Basil and Lemonade. 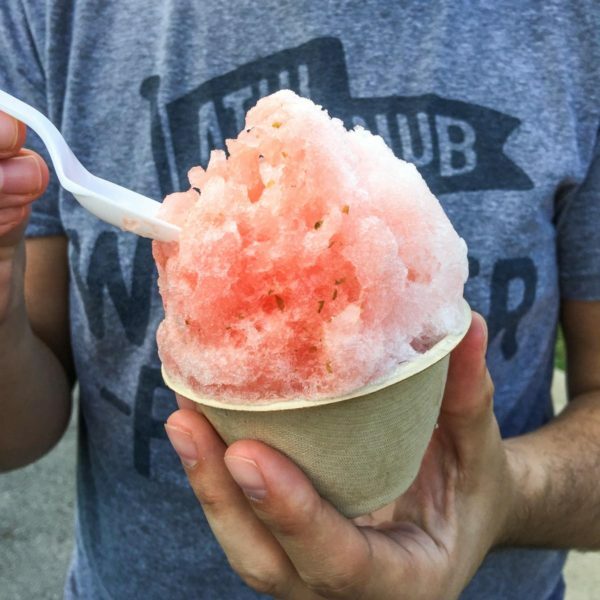 I hadn’t had a shaved ice in years, and it reminded me of when my Mom would take us to get shaved ice after our tennis lessons in Kennebunkport. 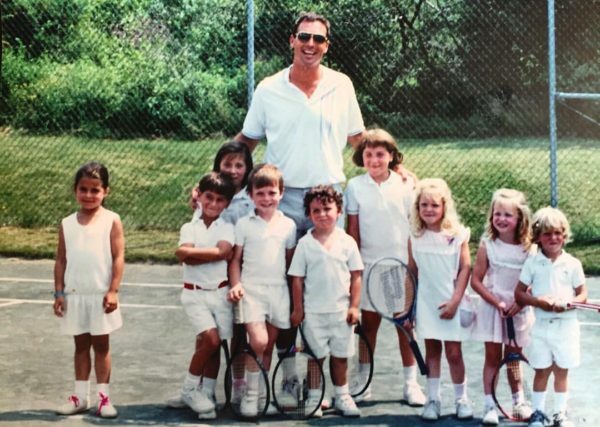 Oh and speaking of tennis lessons, this photo surfaced on Facebook last week. I am the third from the right, My sister is next to me, and my brother is on the end. Too cute not to share, right? Ok, back to Nashville. Charles’s favorite hangout was a honky tonk creatively named Honky Tonk. One night we stopped for beers before our dinner reservation at Merchant’s. 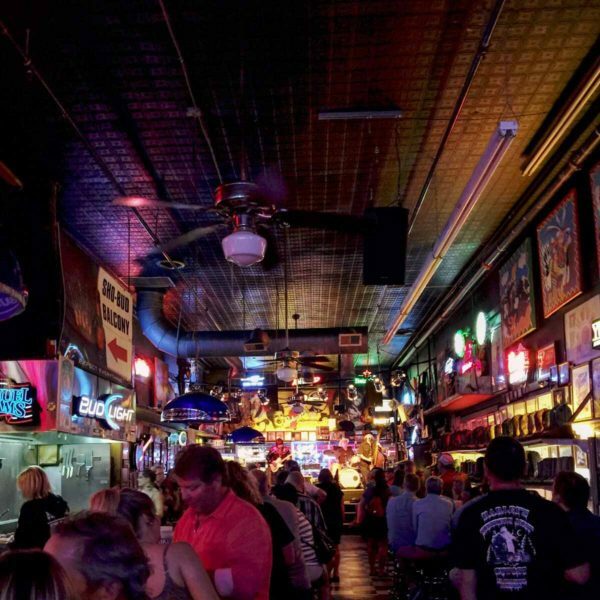 Honky Tonk is a touristy three level bar with live music on each level. It’s also an excellent place for people watching. At one point we counted at least eight bachelorette parties. 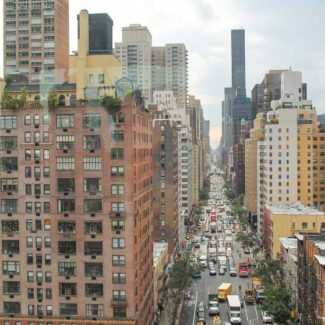 The balconies overlooking Broadway gave us even more people watching fun. Merchants was just across the street, and the restaurant with marble tables seemed slightly out of place in the middle of the Broadway craziness. I had been given instructions that Merchants is the best restaurant on Broadway (and really the only restaurant on Broadway worth eating at). 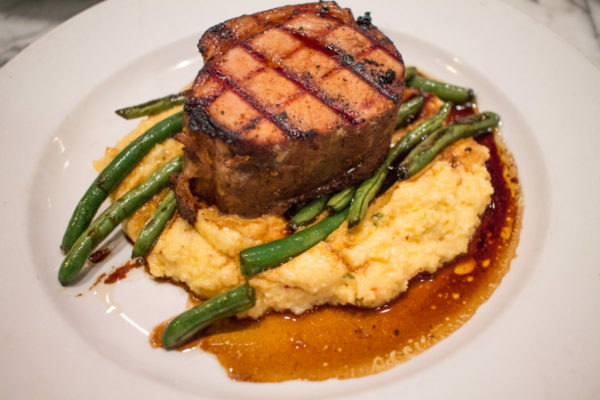 We loved Merchants, it has a Southern inspired menu without the honky tonk vibe. 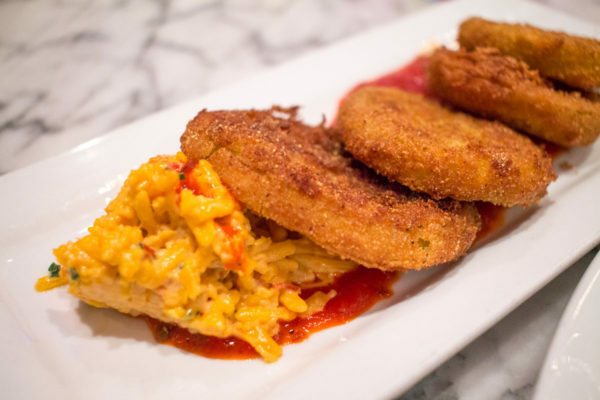 The fried green tomatoes with pimento cheese and tomato jam were fantastic, as were the duck fat fried tater tots. We shared the pork loin and the brisket for dinner. Charles preferred the pork, and preferred the brisket, and we both couldn’t get enough of the cheesy grits that came with the pork. Taking our cue from Master of None again, we ended our night at Robert’s Western World, which was a highlight of our trip. This is the honky tonk to visit. 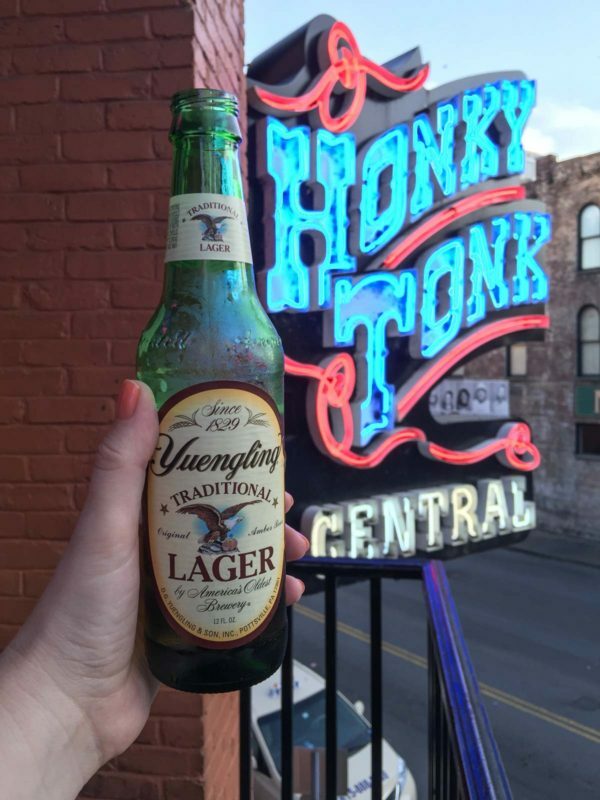 While Honky Tonk felt touristy, Robert’s feels real. I was told that it’s a popular hangout for famous country musicians who might just hop on stage for a song or two. While Honky Tonk had young performers looking to make it big, Robert’s had a band playing that had been at if for decades playing Johnny Cash covers. Robert’s has just the right amount of grit, in some ways it reminded me of Old Town Ale House, my favorite neighborhood dive bar in Chicago. I was told to order the recession special: a fried bologna sandwich, a PBR, and a bag of chips for $5, but I was just too full from dinner at Merchant’s. I’ll consider this missed opportunity was a reason to return to Nashville. Before I went home to Chicago, there was one more place where I needed to eat: Biscuit Love. 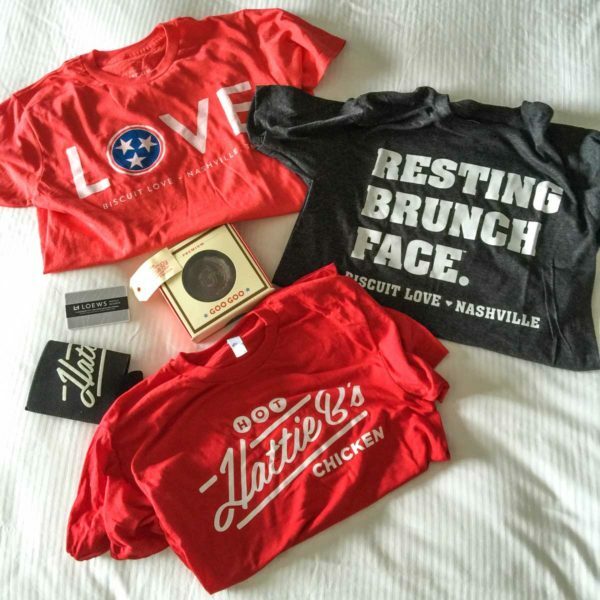 Biscuit love is a restaurant in the trendy Gulch neighborhood that specializes in breakfast, lunch, and brunch. I love a great restaurant that serves brunch fare on a daily basis. A PR friend had given the folks at biscuit love a heads up that I was coming, and they told me to grab at table and that food would be coming out. The first thing to arrive was their famous bonuts. 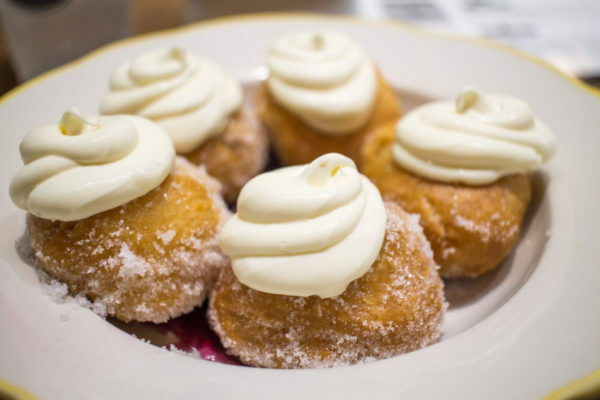 These biscuit doughnuts are made with fried biscuit dough, and are served in a pool of blueberry compote and topped with the most incredible lemon mascarpone cream. They were incredbile. Charles doesn’t really like sweet things, but he loved this. I have been dreaming about that lemon mascarpone since I tasted it. Since I was coming straight from Hattie B’s, they made me mini versions of some of their more popular menu items so that I could try they with out exploding. 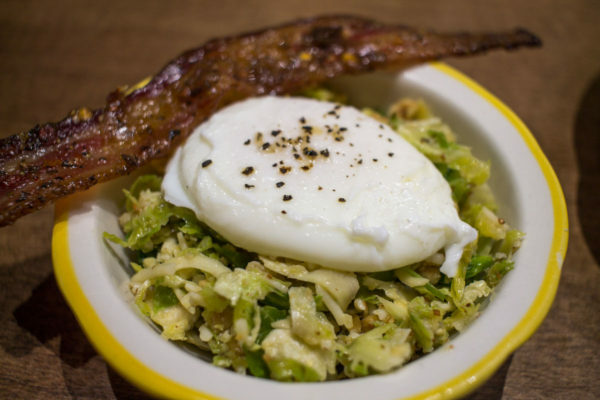 The Lindstrom salad is made with shaved brussels sprouts, hazelnuts, parmesan, and lemon vinaigrette and topped with a poached egg. I loved how the egg yolk mixed with the salad dressing. The bacon doesn’t come with the salad, but it pairs well with it. Biscuit Love’s bacon is called Chronic Bacon and it is a magical sweet spicy and extra crispy bacon. Here is the biscuit and sausage gravy. 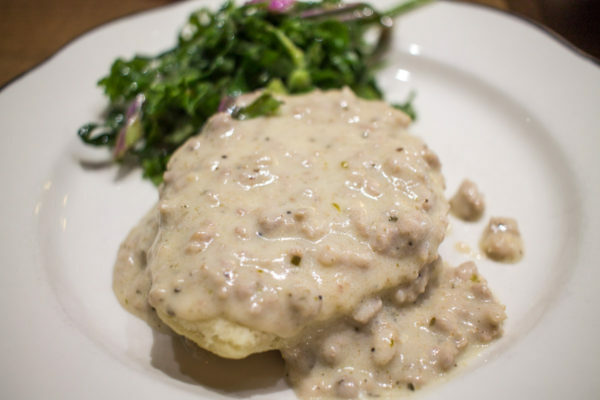 The biscuit was buttery flaky perfection and the rich creamy sausage gravy was incredible. There you have it, that’s where to eat in Nashville. 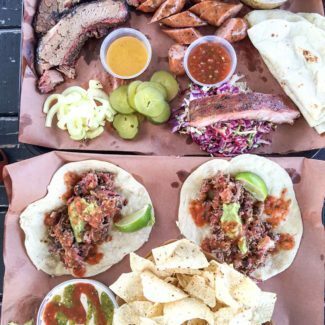 Dine at these restaurants and I promise that you won’t be disappointed. You might even pick up some fun tee shirts along the way! Kitchen Notes is in the Omni Hotel at 250 5th Avenue South. 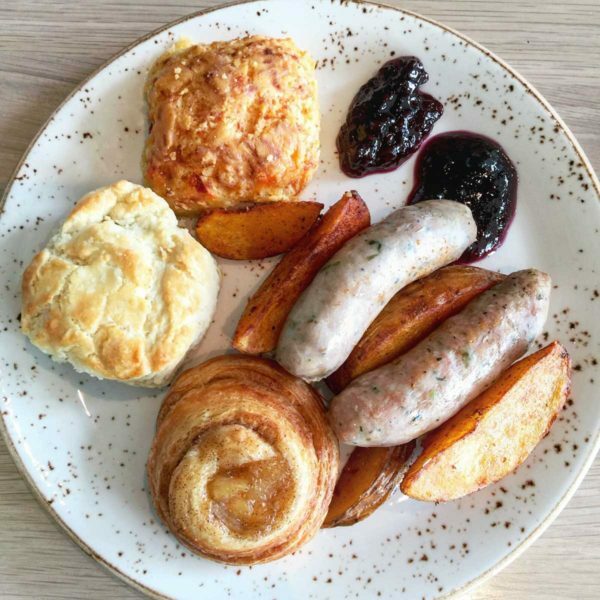 The brunch buffet is available on Sundays from 9-2. 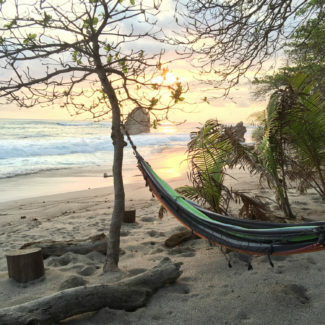 Here is a link to Blue Monkey Shaved Ice’s schedule. Merchants‘ address is 401 Broadway. They are open for lunch and dinner everyday and they do accept reservations. Robert’s Western World‘s address is 416B Broadway. They are open everyday until 3am and there is never a cover charge. Biscuit Love‘s address is 316 11th Avenue South. They are open everyday from 7am-3pm. 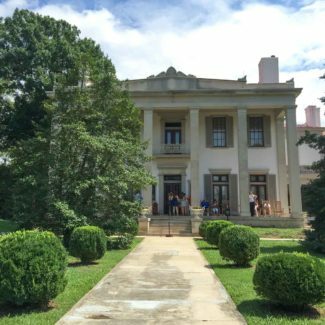 Next week I am going to tell you all about Hattie B’s, which was so phenomenal that it needed its own blog post.